Topeka Cemetery is the oldest chartered cemetery in Kansas, dating to 1859. 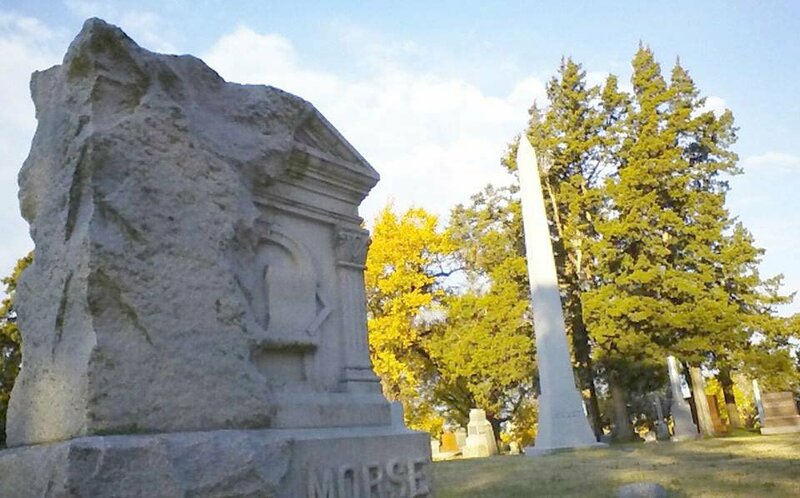 The resting place of an American vice­ president, five governors, as well as countless soldiers, inventors, businessmen and pioneers, there is hardly a more historic site in the state. Its Mausoleum Row was placed on the National Register of Historic Places in 2001. The rest of the cemetery was added to the Register in 2017. Its location, on a rolling hillside just east of downtown Topeka, provides a picturesque setting and a lovely vantage point to view the capital’s skyline. We encourage you to visit, to take a stroll among monuments bearing names familiar to you from street signs and businesses, and to reflect on the beauty of this spot and the lives of those who came before you. 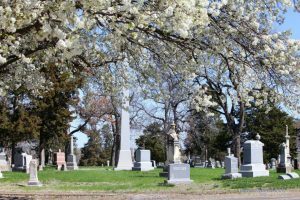 Topeka Cemetery has 80 acres that stretch from SE 10th Avenue to Interstate 70 and from Lafayette Street to California Avenue. Finding family members among the 35,000 souls who rest here can be a challenge. Whether on your first visit or your 10th, it can sometimes be difficult to get to the right spot. Enter Walk-to-Site. You can use your smart phone to guide you. Start by clicking on Search Records. Enter the name of the person you wish to find. On some phones, you may need to move the screen left to find the place to enter the last name. If the person you seek doesn’t come up first, hit the “Next” button. That will scroll through the names that are similar. The large map will show you where you need to be, so you can drive to the general area before beginning your walk. Please keep in mind that not every grave has a headstone. 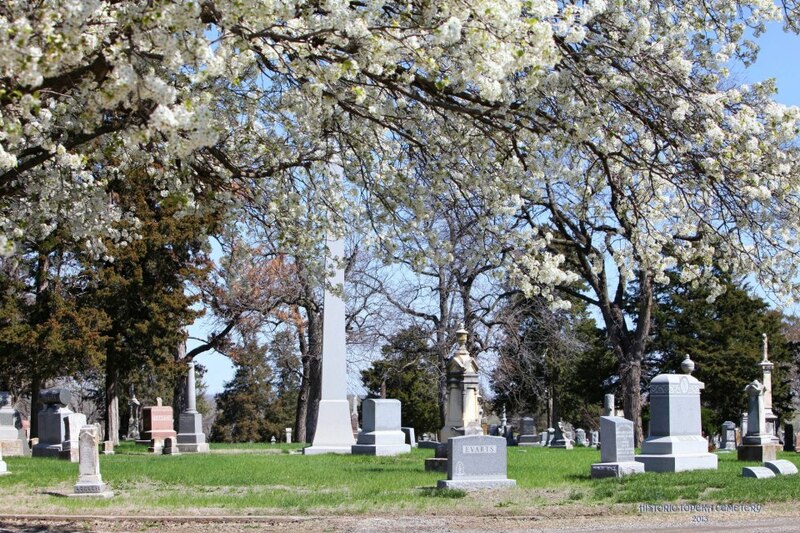 If you find no memorial, Topeka Cemetery is happy to assist you in finding the perfect tribute to your loved one. More instruction is available on YouTube. We consider ourselves an outdoor museum with hundreds of beautiful and interesting monuments! EXPLORE! The Friends have a mission to support Historic Topeka Cemetery in its efforts to preserve its grounds and buildings, promote Topeka and Kansas history, and educate Topekans on the legacies created by their forebears – the extraordinary and the ordinary, the famous and the infamous, the entrepreneur and the artist. The Friends offer tours, including Ghost Tours in October; put on events such as Memorial Day and Veterans Day programs; and offer opportunities to remember your loved ones in unique ways. We are spraying for broadleaf weed control the week of April 8. Please stay off the grass, and don’t bring your dogs to run the yard. This website offers Walk-to-Site technology. Click on “Search Records” and enter the name of the person you are looking for. You may need to hit the “Next” button to scroll to the person you are looking for. You’ll see a dot that is you and a dot that is your destination. Want to learn more about Topeka history? Call to schedule tours or arrange a program at your location.